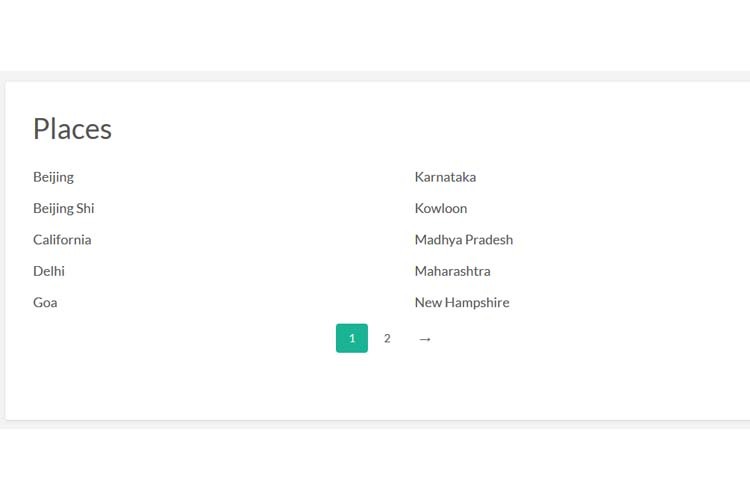 Plugin to display locations/places/states/provinces of listings in mega menu and individual listings pages with seo friendly url. The idea of plugin is to display listigs places location wise in different pages so user can easily get selected place from places list and see listed listings for that place on few clicks. Right now there is not any option to get listings places wise and user have to only use the search option. This idea make your site added more seo urls to rank your site for search engine. Plugin have make place listings or you can say places detail pages seo friends and user same design of vantage theme. Added mega menu in additional to make site more useful and attractive. 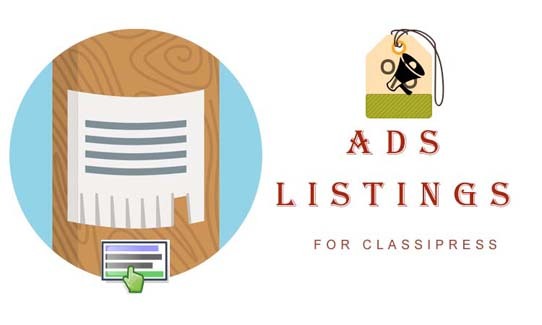 Easy to display listings place wise. SEO friendly place listings url. Places in Mega Menu like category Mega menu. Mega menu places display limit can be changed. Places list in individual page via shotcode. Pagination added on places list page in case of large data. 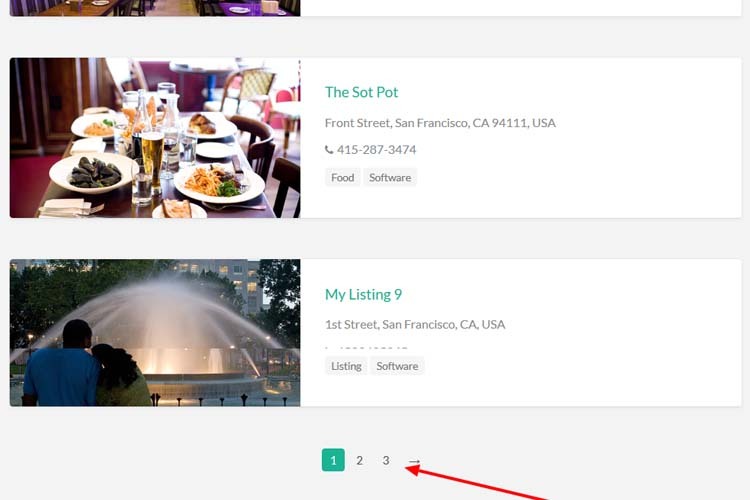 Places wise listing pages which is places detail page like category pages. Display listings layout same as category listings. 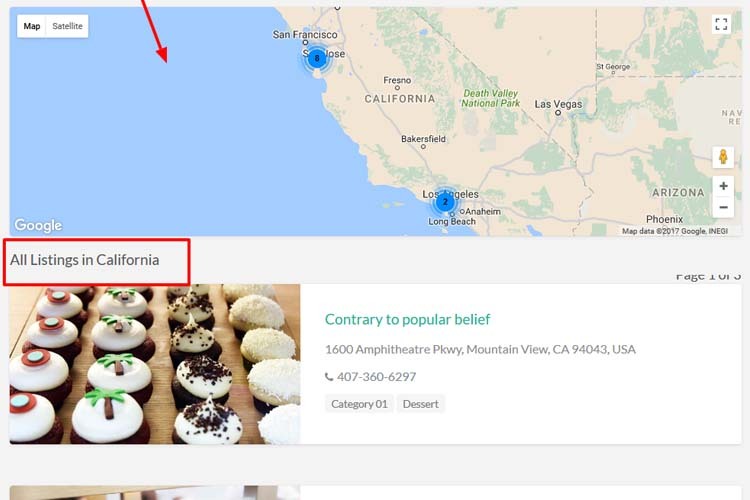 Places related google map at top of listings. Show/hide google map from listings. Pagination option as per theme features. Working with theme settings like post per page. Responsive layout as per theme CSS. Works good for major screen size devices(check demo for more experience). 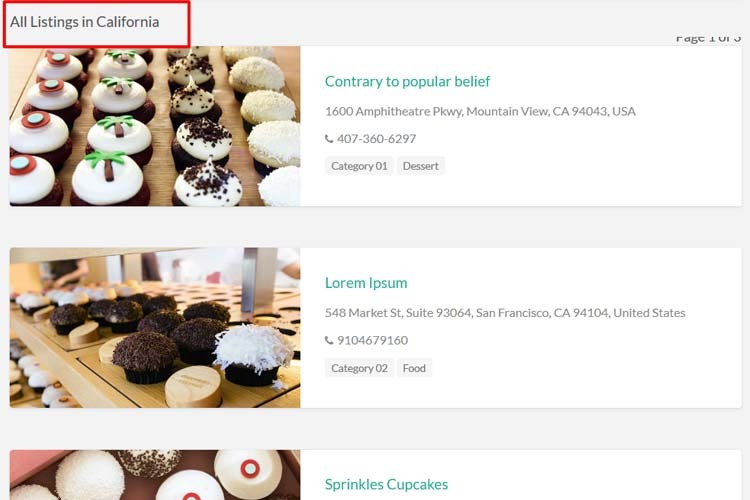 Refine Results for location detail page added. Refine results order by title A-Z, title Z-A, Newest and Oldest listings. Q :: Set mega menu? A :: Create page for listings place and add same page in header menu only. The places mega menu working only for main header menu settings. Q :: Change mega menu display places limit? A :: Go to wp-admin > plugin settings and you can see the option : places per menu to adjust number of places display for mega menu. Q :: Places detail page display 404 page? A :: It seems like you may need to refresh the permalink settings. So please go to wp-admin > permalink settings and click on save settings button to refresh permalink settings. Q :: My website have large number of places? A :: The plugin have added pagination option so as per places per page settings from plugin settings page, it will display paginatin so no problem in page load and user can easily get page and places. Q :: Chnage number of listings per page on places detail? A :: Number of listings per page settings is from vantage theme settings and you may change form there. But make sure it will affected for category listings also. 4)You can see additional “Geo Places Plugin” menu link under “Listings” box at left menus on wp-admin. 5)Make settings as per you want. 6) See the screen image attached with the plugin folder to have visual help what to do. You can contact us directly via email (info(@)wpwebs.com). — Added guide from plugin settings which easily allow users to guide plugin settings. — Some PHP Warning which display on page removed. — Country & City listing page not display properly – SOLVED. 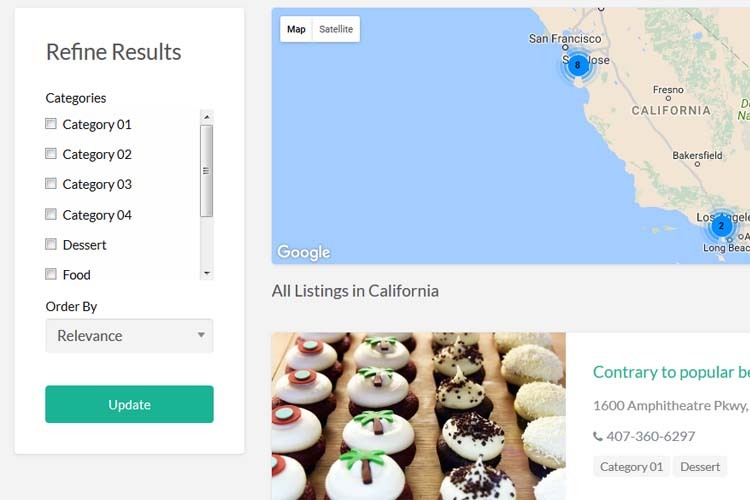 — while listings is not published mode, it was display country, city & states – problem solve, now only display any city, states or country if there is atleast one active listings available. — canonical url not working properly with “Yoast SEO plugin” which solved now. — canonical_url change done, it was not working – ERROR Solved. — Refine Results for location detail page added. — Refine results order by title A-Z, title Z-A, Newest and Oldest listings. Trying to figure out how works. No video or clear instructions after doing the settings. Otherwise sounds promising. 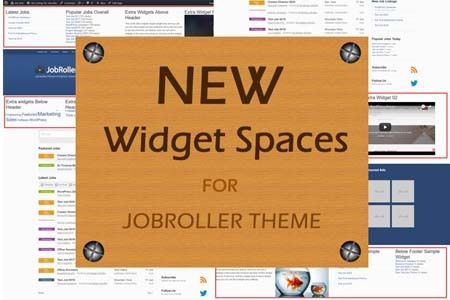 Just wondering if it’s also possible to use the widget to filter Places by categories? Let’s say when a site have a hundred categories, you don’t want to see any shoe repair services when looking for wine and dine in a certain place. Your idea is good and I will discuss with Team and try to add filter for better user experience if any easy and good solution. I did not find any information about how works your plugin. I installed, activated but then what I supposed to do? It is any video? would you like to get guide on demo site please? Also get installation guide from readme.txt file inside plugin and screen images. Is there a way to remove the widget from the results page? I purchased the plugin and was just wondering how I get the ‘Country’ and ‘State’ pages looking the same. You’ll see in your layout on the two pages is slightly different. The country page has all the listings, map etc sitting in a white box and is slightly thinner width wise. The states page is on a transparent background and sits the full width of the site. I’d like to have the country page the same as the state page. How do I do this? Yes it was problem and we have solved in the next version. Is there any way to adopt this plugin to it? It will work similar as working for 4.0, I am not sure right now but it should work and if you feel problem we will update plugin for you sure. i very hope to your help. it now installed. But not active. You don’t worry please send your theme version and wordpress version, and give us 24 hrs so our team will check and confirm the problems. Hi masteroll,, we are still checking the problem, there is no problem for installation but problem created on display pages, we are also improving user guide so it will easy for users to use and plugin setup. What email to send theme and Wp version? hi masteroll, Please get updated plugin version which is working ok with vantage older version also. Vipul, I Installed new version of plugin. But i can’t understand from manual, where Geo places get data (list of countries or states for example). while you go to wp-admin >> plugin settings, we have added details about how to user shortcode and user it. you should user shortcode & create page for country, state & city. And another page for detail listings. Make sure you have properly set settings and then you should reset permalink settings. and it start working. To add in menu, you should insert created pages for country, state & city to header menu. It still getting problem in create page and settings, send me wp-admin temporary login details and url so i will set it for you. 2) How to connect countries to states and after states to countries? Let’s says I choose from countries UK, how the i resieve list of cities in UK , and after choosing city from UK cities, how i recieve places in this city? We directly display related listings. I am interested in this Plugin. Is it possible to charge the listing owner for being featured in a region (instead of the categories)? Currently Im thinking that I will add the continent->country->city to the categories section so that I can charge the owner if they want to be featured in their city. If it is possible to charge owners for categories and regions (with your plugin), would be a worthwhile idea to think about. Don’t get what you want with plugin would you like to mention with some example please? Can I add 200 cities? Will fields from these cities be opened in the form for posts? No actually the city will display as per listing added address . Not like you add city and display on post form.